I’ll be honest– I’ve overlooked strawberries. When I was walking around my farmer’s market figuring out what was the best fruit or vegetable to feature in the next Nutritional DL series, strawberries were never on my list. Strawberries are almost always around, hanging out on cakes, pastries, in almost every fruit cup or platter. If something has a fruity flavor, it’s usually strawberry flavor. In a moment of panic of what to choose, I gave in to the abundance of strawberries (it’s ramping up into the height of strawberry season in California) and made some peace with it. And boy am I glad I did. Though this little berry (which is actually a flower) is so ubiquitous, it’s powerful. And pretty damn tasty. Strawberries have a massive amount of vitamin C. In just one cup of strawberries, you can get 89 grams, or 149% of your daily value of vitamin C. That’s more than one orange! Vitamin C is an antioxidant that’s great for your immunity, producing collagen that helps your bones and skin, and helps keep your brain healthy. In addition to vitamin C, strawberries are also high in manganese, fiber, and folate. They can also help with regulating your blood sugar, and are very low on the glycemic index. Strawberries are packed with antioxidant and anti-inflammatory phytonutrients. This combination is great for your cardiovascular system, which needs the protection from inflammation and free radicals. 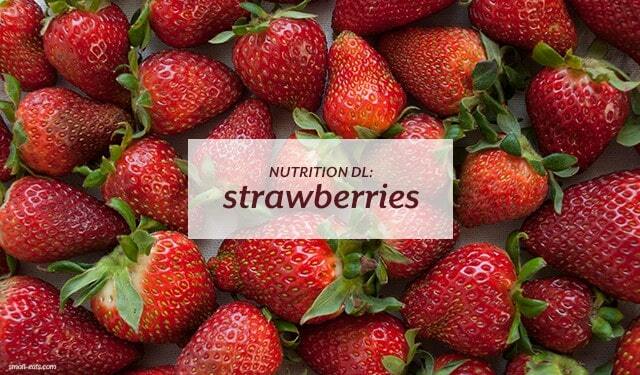 Strawberries, like most fruits, are low in fat and calories. Also like most fruits, it’s got some sugar, with 7 grams in one cup. But before you get concerned, sugar from fruit and refined sugars are different. Your body turns sugar into carbs, which then converted to energy, which we need to function. Like with all things, consume fruits in moderation and eat a variety of them. There are hundreds of strawberry varieties that grow in different climates and times of year. Strawberries are usually most abundant during the spring and summer. They all have their own unique shapes and have varying levels of sweetness. Though they don’t usually label the varieties in the grocery store, your local farmer’s market will tell you the varieties they sell and tell you which ones are sweeter than others. When buying strawberries, look for plump, red berries that are firm and not damaged. Root around in the basket or clamshell they’re sold in, checking for any dented, squished, or moldy ones. Skip any baskets that have mold in them, as mold spreads quickly with the densely packed fruit. Because of their very thin skins, I highly, highly, highly recommend buying organic strawberries. 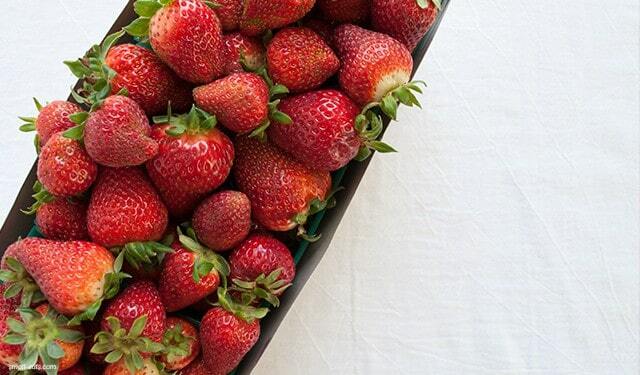 Strawberries are high up on the Dirty Dozen Plus list for it’s absorption of pesticides. If you’re reading this in a season when strawberries aren’t plentiful, go with some frozen organic strawberries. They were frozen during their season and will be perfect for pies, smoothies or snacking.